Nobody was accusing Mercedes of being inefficient, but that didn't stop those German engineers from staying up late with their slide rules calculators supercomputers named Hans trying to squeeze more efficiency from the new C-Class. Apparently, some of that midnight oil was burned in ze vind tunnel, where the engineers decided to lower the suspension, add smooth underbody panels, and make some other boring tweaks, such sealing gaps and streamlining the side mirrors. To make the car even more dreary, they've fitted it with new tires with 17% less rolling resistance (read: less grip). The transmission has been updated as well, now with a longer final-drive ratio to decrease RPMs at cruising speed. Consider this the antithesis of the axe-murdering AMG C63. Full press release after the jump. From spring 2008, Mercedes-Benz will be adding three extra-economical BlueEFFICIENCY saloons to the C-Class range. A raft of intelligent measures and technologies has enabled the fuel consumption of the high-volume C 180 KOMPRESSOR and C 200 CDI models to be reduced by up to twelve per cent, while retaining the high levels of comfort and safety typical of a Mercedes. The BlueEFFICIENCY version of the 100 kW/136 hp C 200 CDI consumes only 5.1 litres per 100 kilometres, while the C 180 KOMPRESSOR BlueEFFICIENCY with 115 kW/156 hp covers 100 kilometres with 6.5 litres of premium petrol. This corresponds to 135 and 156 grams of carbon dioxide, respectively, per kilometre. The third BlueEFFICIENCY C-Class model on show in Geneva is the C 350 CGI with direct petrol injection. The six-cylinder unit burns around ten per cent less fuel than the saloon with the current V6 engine. For the new BlueEFFICIENCY models, Mercedes engineers have harnessed potentials from all fields of development to reduce weight, aerodynamic drag and rolling resistance yet further, and to organise the onboard energy management of these saloons even more efficiently. Together, these measures add up to a fuel saving on the NEDC driving cycle of 0.9 litres per 100 kilometres for the C 180 KOMPRESSOR, and 0.6 litres for the C 200 CDI. between the panes of glass lies a new, acoustically effective plastic membrane which efficiently absorbs wind noise. This has enabled Mercedes engineers to reduce the thickness of the windscreen, achieving a further weight reduction without compromising noise comfort in any way. The noise-insulating lining of the firewall has also been weight-optimised with the help of special materials and the latest calculation methods. Using computer simulations, Mercedes-Benz recalculated the required firewall insulation and precisely redefined the material thickness of the sound-absorbing resinous foam in line with the noise input. This needs-driven redesign reduces the weight of the lining by around 20 per cent. (6 J x 16 ET 39), which have aerodynamic benefits too, are standard equipment for the new BlueEFFICIENCY variants of the C 180 KOMPRESSOR and C 200 CDI. In addition to lightweight construction measures, Mercedes-Benz also devoted particular attention to reducing rolling resistance and aerodynamic drag. In collaboration with Michelin, Mercedes engineers developed lightweight tyres with a particularly low rolling resistance. These are now receiving their series production premiere in the C-Class, and help to reduce fuel consumption. Rolling resistance is primarily caused by tyre deformation as the tyre contacts the road surface. This has a braking effect on the car, since additional energy is required to overcome this deformation resistance. Therefore, the higher the rolling resistance, the higher the fuel consumption. Up to around 100 km/h, rolling resistance has a greater effect on fuel consumption than aerodynamic drag. The belt of this newly developed tyre for the C-Class contains a multi-layered mesh of high-strength steel for less deformation. It is also lighter in weight than conventional designs, enabling a further 1.7 kilograms or so to be saved per set of tyres. The secret, however, mainly lies in the chemical composition: the rubber compound for the treads and side walls is designed to ensure that rolling resistance is reduced by 17 per cent, while retaining the same good handling and braking characteristics. At 120 km/h, the aerodynamic drag of the vehicle body already accounts for around 50 per cent of all the dynamic resistance a passenger car must overcome. Accordingly Mercedes-Benz has been very active in the field of aerodynamics for many years, and has achieved remarkable advances that have had a positive impact on the fuel consumption figures of cars bearing the Mercedes star. With a drag coefficient (Cd figure) of 0.27, the C-Class is among the most aerodynamically efficient notchback saloons in its market segment. This is the result of a whole series of intelligent details, such as the tail lights with ventilation slits: these reduce drag by influencing the airflow along the side walls, causing it to break off at the tail lights without causing turbulences behind the vehicle's rear end. In this way the patented tail lights of the C-Class replace the usual spoiler lips. Smooth underbody cladding ensures that the air can flow beneath the vehicle body without turbulences. The full engine compartment and underbody panelling of the diesel models is also standard equipment in the BlueEFFICIENCY version of the C 180 KOMPRESSOR. Partially blanking off the radiator grille reduces the airflow into the engine compartment, thereby lowering wind resistance. Adequate cooling of the four-cylinder engines is of course uncompromised by this measure. Sealing the joins between the bonnet and headlamps, as well as between the bumper and headlamps, improves the airflow around the front end. The housings of the exterior mirrors were developed in the wind tunnel, and are particularly streamlined in form. Lowering the suspension by 15 millimetres reduces aerodynamic drag, and has a particularly noticeable effect at higher speeds. The design of the new lightweight wheels also meets aerodynamic requirements, and improves the airflow around the vehicle flanks. Thanks to this package of aerodynamic measures the Cd figure for the new BlueEFFICIENCY models has been reduced by seven per cent to 0.25, representing another major contribution to fuel economy. It is not only intelligent lightweight construction, tyres with a low rolling resistance and good aerodynamics that help to further improve the economy and environmental compatibility of today's passenger cars. Intelligent control of ancillary units and the reduction of friction losses can also make an important contribution in this respect. Energy management is the key: in the BlueEFFICIENCY models of the C-Class, the power steering system is controlled on a needs-driven and therefore energy-saving basis. The standard power steering in the C-Class has an additional valve which switches off the servo pump when it is not required. While this pump operates continuously in all driving situations in conventional steering systems, the new valve interrupts the flow of hydraulic fluid when the car has followed a straight course for a while, switching off the servo pump. This has the advantage that the engine no longer needs to provide energy to drive the servo pump, meaning that it operates more economically. Thanks to this technology, the NEDC fuel consumption is cut by 0.14 litres per 100 kilometres - which equates to a reduction of 2.5 per cent in the case of the C 200 CDI. As a further contribution to reduced weight and friction, the BlueEFFICIENCY C 180 KOMPRESSOR and C 200 CDI saloons are equipped with a newly developed final drive featuring further-improved antifriction bearings, forged differential gears and a sophisticated lightweight construction. These measures reduce the friction forces within the transmission, hence the engine expends less energy in overcoming them. The C 180 KOMPRESSOR and C 200 CDI models are both equipped with the six-speed manual transmission with overdrive characteristics as standard. With a ratio of 0.838 : 1 and 0.828 : 1, respectively, sixth gear considerably lowers the engine speed and fulfils a major precondition for fuel-efficient driving. A newly developed gearshift display in the cockpit informs the driver when he should change gear to save fuel. Experience gained during the Mercedes-Benz "ECO Training" courses has shown that drivers are able to make average fuel savings of up to 15 per cent with an economical and energy-conscious style of driving - without any loss of driving enjoyment. In fact "ECO Training" will practically come as standard in the future BlueEFFICIENCY versions of the C-Class: in addition to gearshift recommendations, the instrument cluster features a newly developed display showing the present fuel consumption. This will appear in the centre of the speedometer as an easily legible bar chart. A brief glance at the display is sufficient to tell the driver the current fuel consumption in litres per 100 kilometres. The bar chart responds immediately when the driver changes to a higher gear or takes his foot off the accelerator to use the deceleration fuel cut-off function. Under the bonnets of the new model variants can be found well-proven four-cylinder engines, which are amongst the bestselling power units in the model range: around one quarter of all C-Class buyers opt for these four-cylinder engines. For the C 180 KOMPRESSOR Mercedes-Benz has reduced the overall displacement from 1796 to 1597 cubic centimetres, while retaining the same output (115 kW/156 hp) and torque (230 Newton metres). This downsizing of the engine's displacement, combined with measures for optimising the combustion chamber, mixture formation and engine friction, adds up to a total potential fuel saving of 0.35 litres per 100 kilometres. All in all, the NEDC fuel consumption of the C 180 KOMPRESSOR in BlueEFFICIENCY guise is just 6.5 litres of premium petrol per 100 kilometres. This is 0.9 litres or twelve per cent less than for the standard production model. The displacement, output and torque of the CDI engine remain unchanged. The package of efficiency measures has enabled the NEDC fuel consumption of the BlueEFFICIENCY version of the C 200 CDI to be cut by 0.6 litres (10.5 per cent) to just 5.1 litres per 100 kilometres. This corresponds to CO2 emissions of 135 grams per kilometre. As of late 2008, the BlueEFFICIENCY C-Class line-up will be rounded off by the world's first petrol engine with spray-guided direct injection. Cue the new C 350 CGI BlueEFFICIENCY, which is being presented by Mercedes-Benz at the Geneva Motor Show. Despite generating a higher power output and even greater torque, the new model consumes around ten per cent less fuel than the C 350 saloon with the current V6 engine. The C 350 CGI is therefore set to offer a hitherto unrivalled combination of power delivery, agility, safety, economy and environmental compatibility in this vehicle class. The CGI engine summons up an output of 215 kW/292 hp and 365 Newton metres of peak torque at 3000 rpm. 15 kW/20 hp and 15 Newton metres more respectively than the current V6 unit with port injection. Thanks to state-of-the-art engine technology, fuel consumption of the C 350 CGI BlueEFFICIENCY has been cut to approx. 8.4 litres per 100 kilometres (provisional NEDC figure), approx. one litre below the figure for the current C 350. As such, the new six-cylinder engine makes a major contribution to reducing carbon dioxide emissions. These significantly improved output and fuel consumption figures are achieved whilst still using cost-efficient premium grade petrol (RON 95). The CGI unit also offers an impressive driving experience combined with superb economy and environmental compatibility: the C 350 CGI BlueEFFICIENCY takes just 6.2 seconds to accelerate from 0 to 100 km/h and is capable of an electronically limited top speed of 250 km/h (provisional figures). 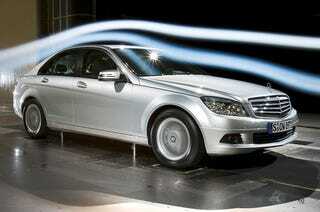 Mercedes-Benz became the first car maker to put spray-guided direct petrol injection into series production in 2006. This technology is markedly superior to the direct injection system with wall-guided combustion used by other car makers, as the Mercedes technology achieves far better fuel utilisation due to its higher thermodynamic efficiency, meaning both reduced fuel consumption and lower exhaust emissions. The six-cylinder engine demonstrates its particular strengths during stratified-charge operation when the powerplant operates with a high excess of air and is thus very fuel-efficient. In the Mercedes direct injection engine, this favourable lean-burn operation with a stratified charge in the combustion chamber is also possible for the first time at higher engine speeds and load ranges because the engine's combustion chambers are injected with several successive jets of fuel in fractions of a second during each power stroke, thereby substantially improving mixture formation, combustion and consumption. Whereas stratified-charge operation was previously only feasible over a limited partial load range, the CGI six-cylinder engine can now be operated in stratified charging mode over a wider range. High-speed, ultra-precise piezoelectric injectors are among the key components of the second-generation direct petrol injection system. The invention of these injectors has spawned virtually all the advances in the spray-guided combustion system. The piezoelectric valves open their injectors outwards to create an annular gap just a few microns wide, allowing the fuel jet to form with a uniform, hollow cone-shaped pattern. Thanks to millisecond switching times, the piezoelectric injectors also permit the multiple injection that promotes lean-burn operation and helps create the ideal conditions for the engine's exemplary consumption figures. A high-pressure pump with downstream distributor and pressure valve supplies the fuel and regulates the amount delivered in accordance with requirements. With a pressure of up to 200 bar, the system develops around 50 times the fuel pressure of a conventional port-injection system. The combustion system developed by the Mercedes engineers, with multiple, closely spaced injections during each power stroke, also serves to enhance the V6 engine's smooth running and emissions characteristics. Measurements show that untreated emissions (hydrocarbons) are reduced by more than half in the warm-up phase. Active control of injection and combustion also produces higher temperatures in the exhaust manifold, thereby warming up the catalytic converters faster. Four-valve technology, variable camshaft adjustment for the intake and exhaust sides, two-stage intake manifold, balancer shaft and an intelligent heat management system with map-controlled thermostat are some of the other technical highlights that the direct injection engine has adopted from the port-injected C 350 engine. The crankcase and cylinder head are made out of aluminium; the cylinders are fitted with low-friction, dimensionally stable liners made out of a lightweight aluminium-silicon alloy. The BlueEFFICIENCY technology for the direct-injection petrol unit incorporates further fuel-saving measures. These include the newly developed windscreen made of laminated glass, which weighs around 1.2 kilograms less than before, forged lightweight wheels and low rolling resistance tyres. The needs-driven and therefore energy-saving control of the power steering also forms part of the standard specification on the C 350 CGI. Finally, Mercedes-Benz has further improved the saloon's very low aerodynamic drag by fitting new, streamlined exterior mirror housings.